Wow! 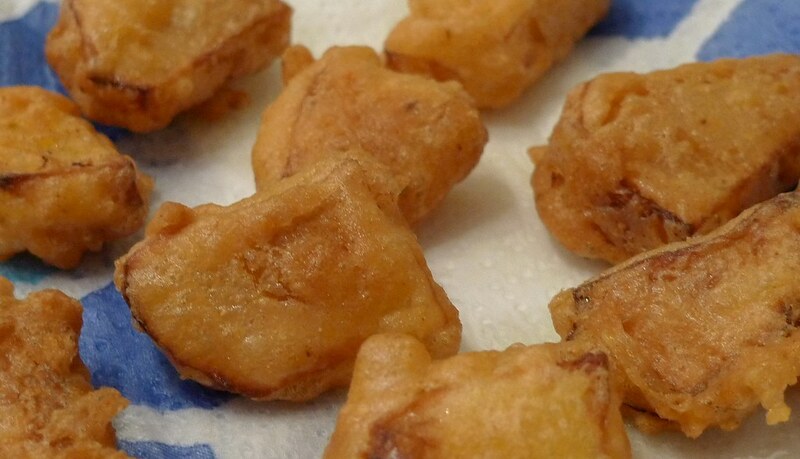 This is such a simple recipe to make, and the combination of crunchy, spicy batter with creamy artichoke is really delicious! We used all the artichokes from the Christmas harvest, and ate the pakhoras fresh from the pan, standing up in the kitchen- they were that good! Credit for this recipe goes to Stephanie Alexander's Kitchen Garden Companion (Quadrille 2010). Put the chickpea flour, bicarbonate of soda and turmeric into a bowl. Dry roast the coriander and cumin seeds separately until fragrant, then grind to a fine powder with the chilli flakes with a pestle and mortar (I'm sure if you only have powdered spices you could use them instead, adding them at step 1). Add the ground spices to the flour mixture and stir. Make a well in the centre of the mixture and slowly add the water, stirring until smooth. Leave to stand for 15mins. While the batter is standing, peel and chop the artichokes into 1cm pieces. As they discolour when exposed to light you might want to put them into a bowl of salted water until you're ready for them. If you have a deep fryer, you can use that. I used a wok, although I'm sure shallow frying would also work. Either way, heat the oil until hot, but not smoking. You want the pakhoras to sizzle vigorously as soon as they hit the oil. Dip the artichoke pieces in batter and gently slide into the oil. Fry for 5 mins or so until golden brown, remove with a metal slotted spoon and place on kitchen towel to absorb any excess oil. Eat immediately- we sprinkled a little salt over ours. Enjoy!